An Up-cycled/repurposed craft project from NaturalGirlDiary, currently on PBS. These little lanterns make cute nightlights and give little hands something to do over the holiday vacation. 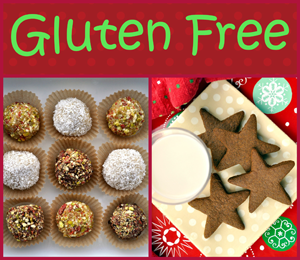 Decorative truffles and classic ginger bread cookies get healthier with my gluten free recipes, as seen on HowDoesShe. 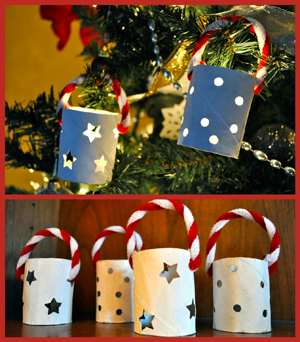 Turn a cardboard tube into a gift holder for kids. Click here for a list of little trinkets that fit inside. This recipe is your starting point to create hours of fun for little ones. Scents like peppermint, gingerbread, and pine can be added to bring on a full sensory feeling of Christmas. Right: Alternate sliced bananas and strawberries to create one very healthy candy cane! 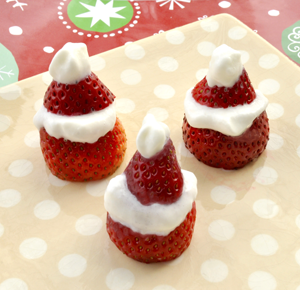 For mini Santa hats, cut green tops and set upside down on plate (bottom left). Slice in the middle and add whipped cream to mid section and top. 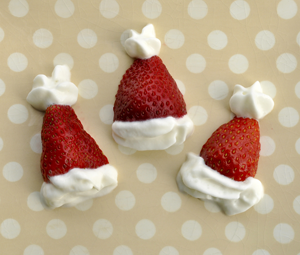 Or, slice lengthwise (top left) and lay them on a plate with whipped cream garnish. 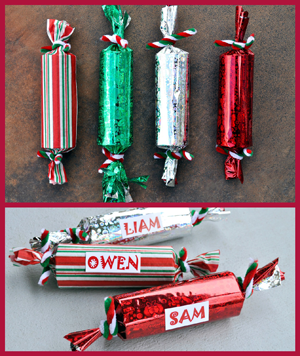 Re-purpose broken crayons into cute stocking stuffers with the use of cookie cutters. Make "Grinch" milk, or tint it red - naturally! Green: Add a palmful of spinach leaves to a blender with milk of choice (rice, almond, etc...) and puree. It won't change the flavor of the milk, but you can add a little honey to sweeten. Red: Add strawberries to milk and blend. 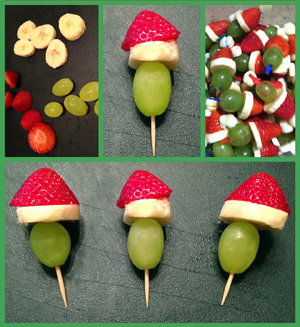 Grapes, banana slices, and strawberries (on a toothpick) are all you need to create these small, fun treats. Pair them with holiday milk (above) and create a theme snack for kids while they read or watch the holiday classic, "How the Grinch Stole Christmas"!